A: The bottom of a concave meniscus. B: The top of a convex meniscus. The meniscus (plural: menisci, from the Greek for "crescent") is the curve in the upper surface of a liquid close to the surface of the container or another object, caused by surface tension. It can be either concave or convex, depending on the liquid and the surface. A concave meniscus occurs when the particles of the liquid are more strongly attracted to the container (adhesion) than to each other (cohesion), causing the liquid to climb the walls of the container. This occurs between water and glass. Water-based fluids like sap, honey, and milk also have a concave meniscus in glass or other wettable containers. Conversely, a convex meniscus occurs when the particles in the liquid have a stronger attraction to each other than to the material of the container. Convex menisci occur, for example, between mercury and glass in barometers and thermometers. Tensiometers measure liquid surface tension based on liquid menisci. Menisci on a thin fiber. The formation of menisci is commonly used in surface science to measure contact angles and surface tension. In a contact angle measurement, the shape of the menisci is measured with a balance or optically with a digital camera. In a surface tension measurement, the measurement probe has a contact angle of zero and the surface tension can be obtained by measuring the mass of the menisci. This is typically done with a Wilhelmy plate. A meniscus as seen in a burette of colored water. 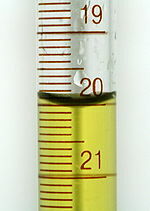 '20.00 mL' is the correct depth measurement. When reading a depth scale on the side of an instrument filled with liquid, such as a water level device, the meniscus must be taken into account in order to obtain an accurate measurement. Depth must be measured with the meniscus at eye level (to eliminate parallax error) and at the center of the meniscus, i.e. the top of a convex meniscus or the bottom of a concave meniscus. Manufacturers of glassware and other tools calibrate their measurement marks to account for the meniscus. This means that any instrument is calibrated for a specific liquid, usually water. Menisci are a manifestation of capillary action, by which surface adhesion pulls a liquid up to form a concave meniscus or internal cohesion pulls the liquid down to form a convex meniscus. This phenomenon is important in transpirational pull in plants. When a tube of a narrow bore, often called a capillary tube, is dipped into a liquid and the liquid wets the tube (with zero contact angle), the liquid surface inside the tube forms a concave meniscus, which is a virtually spherical surface having the same radius, r, as the inside of the tube. The tube experiences a downward force of magnitude 2πrσ, where σ is the surface tension of the liquid. ^ a b Moore, John W.; Stanitski, Conrad L.; Jurs, Peter C. (2005). Chemistry: The Molecular Science. Belmont, CA: Brooks/Cole. p. 290. ^ Biolin Scientific. "Surface and interfacial tension | White Paper". ^ "Fluid Mechanics". Encyclopædia Britannica. Retrieved 14 November 2014.